You might want to offer this African monkey a bouquet of arrowroot, its favorite snack. 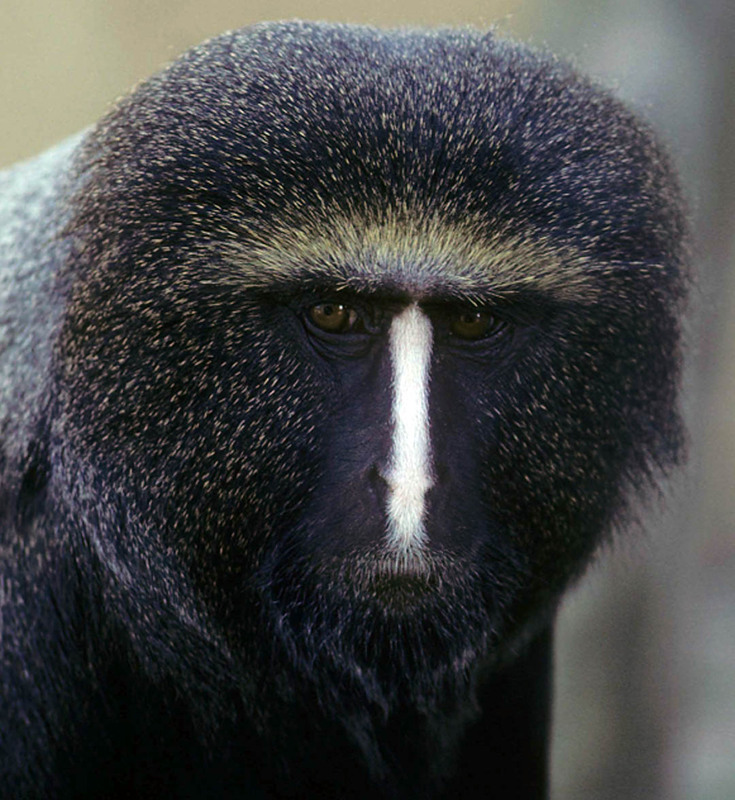 He deserves it: Known as a lesula, the monkey was recently confirmed as a distinct species by Kate Detwiler ’95 and her fellow primate researchers, who gave it the scientific name Cercopithecus lomamiensis. 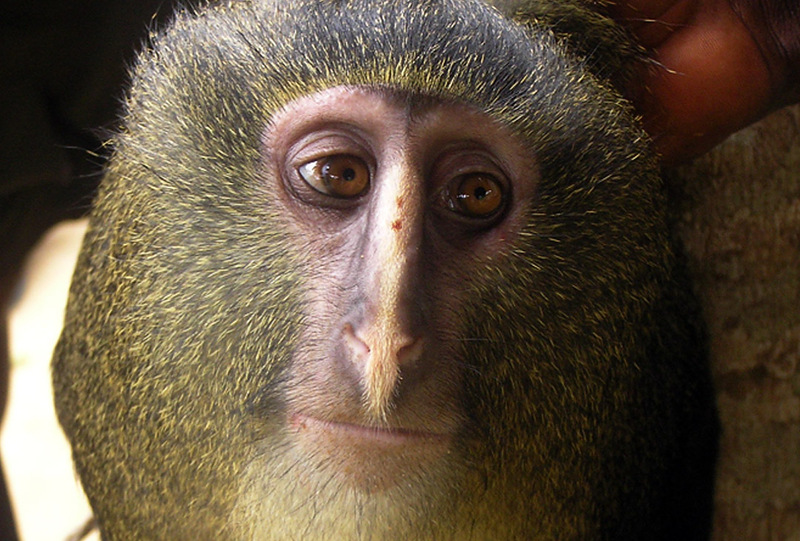 Say hello to a male of the newly identified species Cercopithecus lomamiensis. Photograph by Maurice Emetshu. Published in the open-access science journal PLOS One in 2012, the announcement of the new primate has prompted stories in The New York Times, the BBC and CNN, among many others. It’s only the second new species of African monkey to be confirmed in the past 28 years. In addition to contributing key genetic data to the research paper, Detwiler is also the article’s corresponding author, meaning she was responsible for squiring the paper through the publication process and responding to inquiries about its results. The lesula’s path to species-hood began in 2007, when it was noticed by a research team led by famed primate researchers John and Terese Hart, conservation biologists with the Lukuru Wildlife Research Foundation and Yale’s Peabody Museum. The Hart team was doing a biological inventory in the “heart of the heart of the Congo,” in Detwiler words, when they saw the monkey. Ironically, the animal wasn’t seen in the deepest African bush but in a village in central Congo, where it was leashed to a post as a child’s pet. Over the next several years, the field researchers headed into the rainforest to observe the monkey and gather the heaps of information needed to prove that it was distinct from the very similar Cercopithecus hamlyni, or owl-faced monkey. Detwiler and her fellow researchers were able to prove that Cercopithecus lomamiensis is genetically distinct from Cercopithecus hamlyni, the owl-faced monkey, seen here. Photograph by Noel Rowe. Detwiler entered the picture later, after Hart sent an inquiry to the New York University Molecular Anthropology Laboratory, where she was completing a doctorate, asking for help with genetic testing. An avid follower of the Harts’ fieldwork, Detwiler couldn’t believe her luck. It was as if Watson and Crick had called asking for a little help with a certain double helix theory. “I put everything else on hold,” she said. Additional evidence came from researchers’ assessments of the monkey’s morphology (its form and appearance). While gratified by the media attention (much of it noting the monkey’s distinctive blue buttocks), Detwiler, who studied a similar monkey species for her Bates honors thesis, hopes the story will energize efforts to protect the lesula and continue the inventory work that is a prerequisite to conversation efforts. She has since traveled to the Congo to learn more about the field site and to develop the collaborations needed for further research, including deployment of remotely activated cameras, known as camera traps. “On a personal note, just being in the space and landscape of the Congo basin forest, which is so massive and remote, is so exciting,” she said. “On a global scale, it hopefully will excite us to protect the Congo’s unique wildlife and keep these inventories going.